When the plans for the exhibition at the Municipal Museum of Art in Győr were beginning to take shape, I was somewhat skeptical at first. The old kinds of thematic exhibitions (“send a work of art for the exhibition on the theme of …”) are rarely fruitful nowadays, even when the given curator knows what s/he wants (as in our case). Furthermore, I regarded the Möbius strip as a well-gnawed bone from a scientific point of view and uninteresting from an artistic point of view. I was wrong. The exhibition and the symposium held in connection with it proved convincingly that the Möbius strip continues to be a form of central importance from topological, symbolic and aesthetic points of view. In case of science the – in part new – areas of research, such as the science of symmetry, quasicrystals, ikebana, fractals, spidrons, genetics, nanotechnology or information technology (each of which falls alongside geometry), are sometimes capable of establishing the kinds of new structures and combinations for which a Nobel Prize should be awarded. With respect to art, the Möbius strip can be simply an excuse for the communication of some kind of content, but it can also be part of a conceptual system that initiates new visual chains of thought. Although the major works of the prematurely deceased Péter Gémes (1951-1996) are photographic body-works, the work representing him at the exhibition is an earlier lithographed drawing of his that could be considered an “icon” or “brand” of the whole question: In Search of Lost Time (1990). The drawing seems a bit unassuming, it is no more that a bundle of lines made up of repetitive horizontal 8’s (“8 is a twisted 0” – Ernő Marosi.) The thick black line begins at the bottom left; before it brings an 8 to completion it must be “knotted” twice, as if it consisted of several pieces of wire, then it lays a snare once and finally shades into silver. After a few good vigorous twists, the silver line turns into gold. Eventually the gold disappears somewhere at the center in the field of intersection of the lines, or perhaps it dissolves into another line, so that its course becomes infinite. The symbolism of infinity, continuity, time and periodicity are evident, while the material trinity – charcoal, silver, gold – as a value system and the contrasting “patchiness” of the line prompts reflection. The drawing by Péter Gémes may be compared in more than one respect with Miklós Erdély’s Pencils drawing each other (1975) or the text entitled Time-möbius (1983?). It is perhaps worth offering an explanation as to how lines raveling into horizontal eights relate to the Möbius strip. According to topologists and geometers the strip, which intertwines the second and third dimensions, can be considered from a number of further perspectives. The Klein bottle represents the possibility of opening from the three dimensional into a spatial fourth dimension, while with a further twist of the twisted strip the paradoxical nature comes to a close – to generalize: every odd-numbered twist of the inward closing strip results in a Möbius, while every other twist results in a consistent, simple ring. Taking this line of thought further (even in the literal sense), we may logically conclude – though perhaps not geometrically prove – that every line that takes visual/material form is in fact two dimensional, in other words a plane, band or strip, and one can never know the extent to which it is the three dimensional twisted or twist-free mapping of a symmetrical or asymmetrical conic body. Numerous more and less complex forms or configurations or examples familiar from mechanics can be derived from the Möbius strip or at least bear some relationship to it. Examples include the ring, the tube, the coil, the spiral, the screw, the spring, the labyrinth, the boomerang, the propeller, the knot (or, in its irregular form, the gnarl), the noose, and the braid, as well as their spatial, temporal, energetic, cosmological etc. versions. These can all be extended to the realm of imagistic or conceptual thought, or rather studied as such, as imagery, metaphor and metonymy, stylistic figures, paradoxes, puns – the figures of rhetoric, stylistics, or dialectics. We cannot say unequivocally that pursuit of the Möbius strip and its derivatives is a scholarly activity, nor for that matter that it has direct use in everyday routine or economic life, but it could constitute an object of interdisciplinary research within the framework of a scholarly study of form that could be conceived as part of the history of art. The work of the artist is naturally both more and less than this investigation of an interdisciplinary field. I would like to make a few preliminary remarks to reveal some of the aspects, guiding lines along which I will be discussing the artist’s oeuvre. In this short essay, I wish only to offer starting points, a global insight into the art of Gémes Péter, leaving the possibility for further interpretation. I consider this especially important because Gémes Péter’s sudden re-appearance in the Hungarian artistic scene after his studies in Poland did not help the work of the critics, since it created the impression that his art was discontinuous, that it had no precursor. The fact that his early works were unpublished and that the artist was practically unknown underlined this uncertainty. Further reasons for the difficulties arising in the approaching of his oeuvre may lie in the autonomy of his creative personality: after having found his own distinct voice he remained self-consistent and showed little inclination to join any trend, therefore it is very hard to place him in an artistic group or tendency. The above mentioned facts prompted me to follow the approach of classical art historical monographs, discussing the events in a strict chronological order, and at the same time point out the importance of the biographic elements, the influence of the philosophical and literary sources. By analysing the works created at the intersections, ramifications I aimed to find continuity and coherence in the oeuvre. I wish to point out where the precursors of Gémes’ pictorial and intellectual universe, fully matured by the 90s, can be found and that despite the formal and methodical differences in his creative periods, his oeuvre appears as conscious and homogeneous in its mentality1. Péter Gémes was born in Budapest on the 11 April 1951, to a conservative, upper middle-class family, in an intellectual milieu where daily life was infused with the love of art. It was music that played the most important role in his upbringing. This familiarity with classical music and the piano lessons at home cannot be regarded as a characteristic of middle class traditions only, for it followed naturally from the fact that Péter Gémes’ mother was a composer, a student of Zoltán Kodály’s2. His first experiences concerning fine art were the paintings and drawings of his grandfather’s, who himself was an autodidact painter, but who’s artistic ambitions were past the hobby-level: he systematically educated himself and followed the courses of a German drawing school by correspondence. He mostly made reproductions, and because of the shyness that characterises amateur painters, he only let his young grandchild stay when he worked. His interest for fine art and his good drawing skills, noticed at an early age, drove Péter Gémes to a drawing group in primary school first, then to the secondary school of fine arts where he studied applied graphics. It was around this time that Gábor Pásztor started teaching him at the secondary school and, under his guidance, besides applied art they also studied fine art graphics. They made etchings and lithographs and Pásztor, who ”surrounded himself with Rembrandts”3 – introduced his pupils to the secrets of the great masters’ ateliers. The productive professional relationship, the intensity of the discussions between the teacher and his pupils is reflected in the fact that Péter Gémes was inspired by his secondary school experiences in art even during his years in Poland – he defined his connection to Pásztor as the only master-disciple relationship in his life. Having failed at the entrance examination to the Academy of Fine Arts, between 1969 and 1971 he studied at the School of Window Dressing. After another few unsuccessful attempts to enter the Academy and fearing the threat of the obligatory military service he finally decided to continue his studies at the Warsaw Academy of Fine Arts. It is not an exaggeration to say that his choice was unwilling: during the chaotic cultural policies of the 1970s, it seemed to be the only fruitful option. Nevertheless, this decision was not arbitrary, for Péter Gémes already took an interest for progressive contemporary Polish art during his secondary school years and was a regular reader of the periodical Poland. Sheer interest without the weight of the desperate circumstances would not have been sufficient motivation though for making this serious step: accepting an unsecured existence abroad and having to be constantly in a peripheral situation because of the language difficulties. At that time the structure of the Polish fine art training was significantly different from the Hungarian one. There were more specialised subjects at the Warsaw Academy and fine art and applied art were taught together. Out of the three graphic subjects he chose lithography, but because of the demands of the Polish educational system he had to graduate in painting as well, as a student of Stanis³aw Poznañski’s. Apart from the names of some of his artist teachers – not very well known in Hungary – we know little about his years in Poland, and the artist’s accounts suggest that apart from professional, technical knowledge he received no significant inspiration for his art at the academy. The lithographs he made in the seventies in Warsaw constitute – apparently contradicting the statements of the introductory part – a separate, discontinuous group of works with regard to the whole of his oeuvre. Taking a closer look at these works it becomes clear that they do not form a distinct, closed period. They are only signs of a young artist’s search for his own voice. This separation – which may even appear forced – from the whole of the oeuvre is not an arbitrary decision from my part: Péter Gémes himself drew here a caesura. He himself could see that in these pictures he could not find an adequate form for his artistic invention. Besides the exaggerated narrativity in these works no problems of form or immanent tension arose, that could have served as a basis for the future development of his style, so this path proved to be a dead end. The lithoghraphs reproduced here only remained in existence by hazard, the rest of the series was destroyed by the artist himself. There is only one source where there is a brief mention of this rupture. In an interview, speaking of his return to Hungary he mentions the disappointment he felt for the work he did in Poland and for his artistic convictions at that time, when he was looking forward to being inspired by his new artistic surroundings4. His works made in Poland are all lithographs, with the exception of the series Mirage I–IV. It is the influence of pop art and hyperrealist art that can be most easily detected on these sheets, where he raises popular visual toposes into his compositions created within a method of building the picture systematically and interprets them in an entirely new context. His attitude in choosing his topics could be described by Miklós Almási’s phrase ”ironicalising the popular icon”. He takes everyday, insignificant objects, knickknacks and represents them using the familiar composition of advertisements and posters, picturing them in a monumental way. In his lithograph entitled Complet a cosmetic set: a plastic hair and clothes brush of common, cheap design appears – in a velvet case which would merit to hold the crown jewels – in an enormous size. During his first years at the academy, he took a deeper interest in hyperrealism, and this attraction must have been strengthened by his studies at the School of Window Dressing as well. The first period of his life’s work ends with six paintings made in 1980, where he used the air-brush technique for the first time. These works, despite the similarities in size and elaboration do not constitute a series in the strict sense, because the artistic problems proposed in them fundamentally point in different directions. Gémes’ attraction towards everyday objects still plays a role in the composition entitled Still-life (the Hungarian original also meaning silent life): the photorealistic rendering of the toiletry set on the dressing-table bears all the characteristics of the pop art attitude. At the same time the method of confronting the figurative elements of the picture with abstract forms is already present here with the same emphasis, creating a kind of floating tension and uncertainty not only by the surreal pairing of objects, but by sheer means of painting. The pun in the title adds another layer of meaning to the piece, for it directs us towards a notional dimension beyond visuality, where the objects – as the decorative accessories of femininity – become the symbols of the superficial and passive, vegetative sides of the feminine existence in the Freudian sense. From the air-brush paintings made in 1980 we only know of one that’s main motif – a lot later though – was used again by Gémes, reconsidered in a completely different context. His painting entitled The Female Hamlet pictures a woman’s delicate hand holding a skull, next to it a decorative, deep red velvet rose. This painting, which could be considered as the matching pair of Still-life, is still an ironic approach to femininity and his greatest concern in the composition is decorativity, the rhyming of the forms. To the painting Exit, made in 1990 it only relates through its basic motif: the topos of a woman’s hand holding a skull. The starting point of this picture, made for the exhibition Hommage à El Greco (1991) at the Museum of Fine Arts is an enlarged fragment of El Greco’s painting, made around 1580, entitled Mary Magdalene. ”Gémes treats one of the central points of meaning of the Mary Magdalene painting: the relation of the skull representing the transitoriness and vanity of life and the meditating Magdalene’s hand’s multiple meaning, allusive, indicating, relying gesture” – wrote Eszter Babarczy in the catalogue of the exhibition. By omitting the biblical context, removing the motif from its original environment and enlarging it, the hand and the skull become a universal symbol, a meditative picture on human mortality. The painting entitled Blindfolded Self-portrait is the one that leaves behind the superficiality, the fake professional virtuosity that often characterised his earlier works, eliminating the pure visual gags. The obstruction of the senses, the inability to see is represented by three synonymous visual signs: a portrait of the artist blindfolded, a schematic eye crossed out and a white X on a black surface, the visual equivalent of linguistic synonymy all cover the same field of meaning. Between 1978 and 1979 Péter Gémes worked at the lithographic atelier of the Warsaw Academy once more (where he returned owing to a scholarship from the Ministry of Culture) to perfect his professional skills. After his return to Hungary though there was not only an aspectual change in his art, but from this point his works include a new medium, the photograph as a tool of visual art. Since in Hungary there was no lithographic atelier at disposal where he could have continued his graphic art he turned to photography out of necessity. It was not an arbitrary choice at all, the appearance of photography in Gémes’ career is not without precedence. In the mid-seventies he participated in courses which dealt with experimental use of photography. They took photographs of scenes set up in advance and then manipulated the pictures during the development. 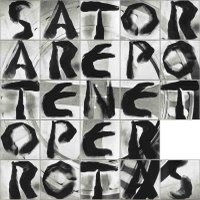 These type of prearranged photographs constitute the basis of his works made in 1983, which he arranged into series – by applying them on cardboard and adding texts. (Prometheus series, Consolation series). In processing the photographs used in the series, he applied the method of multiple exposure and the technique of photographing one negative on another, and in the last work phase, he composed his pictures with the montage technique. The finished opus is a complicated construction of texts, quotations and images where the photographs and other elements constitute building blocks of equal status. The pictures of the series entitled Photographic Etudes mark a completely new period in the Gémes-oeuvre, even with regard to the application of the photo technique. A more refined picture building method, summarising previous experiences – with the complete elimination of the texts and the montage characterise this period of ten years. Péter Gémes’ photo-based works cannot be considered as photographs, since their function isn’t the documenting, capturing of a moment, or exact image fixing. Taking the photograph is only a phase of the complicated creative procedure in which we could say the negatives take on the role of the raw material. In all of his works he photographed himself, he was the model for every single figure. The artist made himself the target of his camera, in this special relationship Gémes was not only the operator, but the eidolon too. But we cannot continue at this point on the line of Barthes’ terminology, because the artist is not a made a helpless object before the cold eye of the camera, but he is the great machinator, who controlled every phase of the picture’s creation. While the photographs used in the Consolation and Prometheus series were shot in an attic, the pieces of the Photographic Etudes were taken in the unrecognisable darkened space of an atelier. He only used a very small lightsource while making a picture. The only object giving light during the exposure was a torch moved by his wife, which scanned the figure and as a result of this the pictures are characteristically blurred and dream-like. With this, Péter Gémes involved his wife and later his children in the work procedure. ”This is a very likeable and very human side of Péter Gémes’ art who would have liked to involve those closest to him in his work” – says László Beke in the foreword of a catalogue. He used the torch’s spotlike source of light as a paintbrush too, during the time of exposure he drew symbolic shapes playing an important part in expression with the light. It is evident from the particular treatment of the negatives that Péter Gémes approached photography with a lithographer’s attitude. ”I tried to maintain my former way of thinking even when I was using a different means. I used the ready negative as if it were a lithograph stone, even though it is much smaller. This is why, unintentionally, I approached the work on photopaper from a different perspective”5 – he wrote. Gémes felt a connection with László Moholy-Nagy concerning the employment of the photo technique in creating a picture. In the 1920s Moholy-Nagy developed, simultaneously with Man Ray and El Lissitzky, a procedure he named photogram. This was the first step towards photography becoming a creative compositional means, instead of having only a purely reproductive function. This technique for him held many unexploited possibilities since light appeared as a new compositional factor, a newly discovered material, with which he could do various experiments. He imagined the reconsideration of the productive possibilities of photography through the utilisation of the light sensitive feature of silver bromide sheets. The mysteriousness and poetic atmosphere, the ”visionary world” (Krisztina Passuth) of Moholy-Nagy’s set compositions – which were made without a camera, only using the photogram, based on the light sensitivity of the paper – and Gémes’ works show stylistic similarities as well. Light in Gémes’ oeuvre did not form the subject of optical, visual studies but it was present rather for its spiritual aspect, its fundamentally transcendental quality. Photography – following from its above mentioned characteristics – became the ideal tool for conveying these meanings. In the 1970s in Hungary, under the influence of conceptual art, the artists’ attention was drawn towards experimental photography. Although no orthodox conceptual art groups were formed, there were no conceptual artists in the strict sense of the word, the ideas put forward in the theoretical foundations of the trend had an effect on the activity of several experimenting artists at the time. Disregarding the material and auratic quality of the works and abandoning art-object fetishism led the artists to experiment with new media. It is not a coincidence that photography became one of the tools used by the artists inspired by conceptual art: the reproduducibility of the photograph questions any definition of art based on the uniqueness of the objects of art, and at the same time it is temporary and damageable (negatives). Experimental photography acquired such weight in Hungary that László Beke in his article entitled Photographic vision in Hungarian visual art (1972) not only announced this development, but also attempted to categorise it, point out the parallelisms and even set up a new terminology for the interpretation of the works connected to photography. In his writing he analyses these works from the aspect of reproductive, documenting, magical and metaphorical function. The most significant representation of the new tendency was the 1976 exhibition entitled Exposition. In the catalogue of this group exhibition organised by László Beke and Dóra Maurer at the Hatvany Lajos Museum the authors attempted to reinterpret photography and place it in the context of art history. The photo using in the Hungarian art scene is also connected to the Makó Graphic Artists’ Collective founded in 1977. 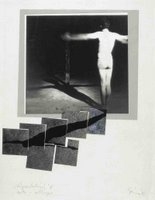 The approach to conceptualism manifested itself through experiments in photographic, graphic and printing techniques. As István Dévényi said about his work in Makó: ”When we were making the list of names one of our criteria was to have divers tendencies, ones that attempt to legalise the techniques from different standpoints.” The inspiring, experimenting spirit of the artists’ collective led even the classical and illustrative graphic artists to use experimental photography. In 1982 István Hajdu became the leader of the Makó artists’ collective, who arrived with a fundamentally new concept, since he was more closely related to the avant-garde movement. He was the one to invite János Szirtes, Frigyes Kõnig, József Gaál, András Baranyay, István Gellér B. and – for the first time in 1987 – Péter Gémes to the collective. Péter Gémes’ use of photography is unique in Hungarian art and it is described by the technical term ”magical photography” first used by László Beke. As I have already mentioned, in these ritual, transcendent photographic compositions it is always the artist himself appearing as the figures. There are numerous examples of this attitude – the artist being his own model – but we could only mention them here with respect to how they differ from Gémes’ art. That is to say in Gémes’ relation to the portrayal it is not the self-representing or self-reflecting intention that dominates, but identification with the medium and hiding. (This hiding behaviour corresponds to András Baranyay’s philosophical self-portraits made in the late 1970s.) On the other hand, the performances – in which self-representation is the most frequent – and the documentary photographs, the photo-graphics created from them (e.g. the photographs of Béla Kelényi) were conceived to reflect on personal and artistic life. Among the works featuring the artist himself the ones that can be placed furthest from the Gémes-attitude are the action-like photo series transformed into graphics of Tibor Hajas (e.g. Flesh-painting I–III.). These works, in the case of an artist constantly in quest of personal presence, can be interpreted as ”prearranged self-portraits, that is Hajas’ physical and intellectual imprints” (Attila Horányi). At the Warsaw Academy there was great emphasis laid on the teaching of philosophy in the first two years. Gémes hadn’t mastered the Polish language well enough yet to take part in philosophical text analysing courses, so when he returned to Hungary he felt that his education was distressingly deficient. ”When I started to sort out my ruins, the bricks of a demolished building, then these were missing.”8 He began his philosophical studies with great vehemence, going systematically from the ancient times up to today, from Aristotle to Béla Hamvas. The enthusiasm with which he started reading philosophy witnesses a certain vacuum: when Gémes left behind the first creative period, his works made in Poland, he wanted to find a new basis for his, art and to find the new direction he turned to inspiring sources outside the domain of fine art. On the other hand, his deep interest for philosophy shows the influence of conceptual art, where besides the visual and sensory effects of art great importance is attached to the conceptual, intellectual nature of the works. We do not know whether by this time Gémes had read Joseph Kosuth’s fundamental writing, in which he tries to define the nature and function of art through philosophical and aesthetic reasoning and attempts to outline a radically new concept of art. In any case the fact that Gémes took the whole range of philosophy as a subject to study is reminiscent of Kosuth’s approach. The Prometheus series (1983) is the first of his works bearing the signs of the theoretical influence of conceptualism and it is related to this trend by its genre as well. The series is actually a plan, an attempt to reconstruct the string of thoughts that preceded the actual painting of an already existing work. The painting serving as the basis of the Prometheus series, a piece entitled Space Cross that Gémes made in 1983 was unfortunately destroyed. The only existing reproduction of it is in the form of a postcard, and it represents only a mutilated version of the original piece. According to the original concept, the monumental form of the Latin cross in the centre is surrounded by light, whereas in the realised painting the luminosity of the cross is omitted. The series consists of eight cardboard pieces, each one having the same ternary division structure9. A sequence of 3–5 photographs applied on a black background appears in the top third of every piece. These sequences relate to the same visual thought. Underneath them we see texts, written by hand or put together from cut out letters, always accompanied by a larger photograph. The photographs are also the results of several procedures: they are created either through the mounting of several negatives on each other or through the fixing of the movement during the repeated exposure. Because of the analytic aspect of the work, the pieces are arranged in a strict order, the first one being a collage named Prometheus ouverture. The rest of the pictures are connected by their titles (Cogitatio, Meditatio, Contemplatio, Constituo, Consisto, Constructio), because the work is the analysis of the stages of intellectual activity, in which Gémes aims to create a pure, logically closed structure. The build up of the theorem progresses towards the conclusion through the parallelisms of the images and texts appearing on the pieces entitled Contemplation, Meditation, etc... whilst reflecting on the metaphysical questions of the cross, of the figure of a human body representing the Saviour and of nothing, empty space. The work therefore documents the reconstruction of a string of thoughts arising during the creation of a piece. There are three emphatic visual elements varying in the pictures, which undergo different metamorphoses: a photograph of the artist with his arms stretched out, the picture of a window and a photograph of a three dimensional cross constructed of sticks. Throughout there is a strong formal connection between them, they affect one another and the final construction is built up of them. Every single visual topic bears multiple symbolic meanings and references to the cultural past, which are thoroughly investigated by Gémes in this work. The last piece entitled Space Cross is the pictorial synthesis of the cross as the divine thought materialising in the human body, the human figure, and transcendence, a window opened towards light. Béla Hamvas, as the last representative of sacral metaphysics had an enormous influence on the intellectuals of the 1970s and 80s. His works were banned so they were circulated in manuscript form only. This is how Péter Gémes got his first Hamvas volume (from Zsigmond Károlyi) entitled Revolution in Art (1947). The reason for Hamvas’ popularity lies not only in the mentality of his works or in the identification with his metaphysical concept of the universe. When the book he wrote together with Katalin Kemény was published Georg Lukács condemned it so strongly that it eventually led to the ban of all of Hamvas’ works. The prohibition of public appearance placed him in a peripheral situation and the identification with an autonomous personality expelled from public life added a great deal to Hamvas becoming a cult figure. The concluding collage of the Prometheus series is an example of a concrete reference to Béla Hamvas, an almost literal quotation of his principal work, the Scientia Sacra. Besides the representation of the Space Cross the construction of Hamvas’ metaphysical universe is built up of words arranged in a geometrical order reminiscent of visual poetry – in a sort of table – as a final conclusion to the analytic investigations. The visual equivalent of this in Gémes’ work is the pictorial synthesis of the window (through which the transcendent becomes visible) the figure with outstretched arms (a reference to the Saviour) and construction of the spatial cross. The function of these pictures is not only the illustration of Hamvas’ philosophy (although we can find examples of such didacticism too) but they follow parallel dimensions of thought. The quotations and images aim at building up a monumental construction of thought based on complicated references. The texts show great diversity, we find among them personal contemplation on the relationship between the cross as a form and its intellectual content (”I fold the superficies of the cube, I enclose the space in the line of the plane, as into the lateral view of a point. I define my relation to the point.... Religion is the incarnation of the divine will in man.” ”The cube signifies spatiality, by holding it in my hand I define the place of my imagined reality in Nothing.”), quotations from Saint Augustine (”Without this I may chose anything of the extended space, I will see it as nothing. As absolute nothing, not even as something empty, like when we move an object from its place and the space remains, deprived of the object...”) and quotations from a poem by Ezra Pound. The citation on one of the pieces is the first few lines of Pound’s first Canto. But these lines – as all 67 lines of the first Canto – were translated from a Latin version of the XI. Book of the Odyssey by Pound, therefore Gémes builds the epic into his work through the complicated system of quoting a quotation. While through the writings of Hamvas Gémes explores the depths of synthetic thinking, Ezra Pound’s poetry with its unique linguistic structure is similar to Gémes’ picture constructing method. This is not an arbitrary comparison on my part, for Gémes’ attraction to the poet’s work did not manifest itself only in the quoting of a few poems. Throughout this creative period he stood under the spell of the poet. Ezra Pound, one of the greatest figures of English modernist literature developed his own unique method of versification. Before he embarked on his large-scale project of writing the Cantos – with which he wished to surpass such works as the Divina Commedia or the Odyssey – he wanted to lay the foundations of a new poetic language worthy of the project. Thus, he started his work by the renewal of language and poetry. The study of Chinese ideogrammatic writing and of the Haiku poetry played an important role in this, and he was fascinated by the compactness of this poetry based uniquely on metaphors. His poetic language is built up of basic units such as the retelling of mythological stories, literary quotations, extracts from the diaries of famous personalities and from his own... From the seemingly incoherent mixture of these units emerges the ideogram, which represents one intellectual and emotional complex. This short detour was necessary because there seems to be a substantial similarity between the two creative methods. In Gémes’ art by having quotations and short writings together with the pictures, the static construction of thought appears in a similar fashion. The two also resemble in their mentality. In Gémes’ oeuvre, the motivation to find the common roots of different cultures and traditions becomes more and more accentuated. Ezra Pound attempts to give a lyrical synthesis of antique polytheism and Christian mentality in his epic: he depicts the figure of Christ and the antique Sun-God merged into one, culminating in the final conclusion of ”Amo Ergo Sum”. The Consolation series finished in 1983, inspired by Boethius’ work entitled The Consolation of Philosophy is closely related to the Prometheus series. In this work he remains loyal to the individual voice he found in the Prometheus series, and continues to use prearranged photographs. The quotations and captions play a less important role though, he rejects the method of emphasising the notional parallelism or identity of the text and the image. Boethius’ thoughts are not present in the form of citations, there is a more refined and subtle relationship between the inspiring text and the pictorial elements than before. This distinction becomes significant in the context of the whole oeuvre, since it draws attention to a tendency in which the relation of Gémes’ works to their philosophical sources changes. From being the inspiration, they transform into a sum of reference points, sometimes only defining the direction of interpretation through their titles. Gémes’ Consolation series can be conceived as the projection of the contemplation of the metaphysical problems proposed by the philosopher. Boethius’ life and the circumstances in which the book was written are important to us because this work affected Gémes not only by its philosophical maxims. The Roman philosopher and poet took on an important role in public life, in an unstable political situation, unfavourable for the Roman aristocracy. Following the ideas of Plato – of whom he was an admirer – expressed in the Republic, he felt that it was his duty as a philosopher to accept an office, which would allow him to protect the citizens of the republic. Accused of high treason he was imprisoned and executed in 524. He wrote his influential work, Consolation in prison, in which we hear the voice of a man facing death, looking back on life from a different dimension; the author speaks by the right of the last word, which endows his thoughts great authenticity. Philosophy materialises in the allegoric shape of a woman representing wisdom in front of the philosopher awaiting death on the periphery of life. During their dialogue abstract philosophical ideas come to life and Philosophy restores Boethius’ faith in life and divine wisdom. Gémes therefore chooses a piece as a basis that aims to point out the errors and difficulties keeping man from discovering divine wisdom, so that they see the questions of sin, mortality and happiness on earth with Philosophy’s perspicacity. ”Every direct speech of transcendence counts as a taboo in modern art. Because the field in which we can talk about it without didacticism, declamation and declaration is very narrow.” – writes Zsuzsa Simon in an essay. Péter Gémes is one of the few in contemporary fine art who not only managed to avoid these difficulties, but also moves in this certain narrow field with confidence. The Consolation series is composed of five cardboard pieces on which the artist applied photographs mounted on one another. The linear reading of these sheets is important: they represent the stages of man’s spiritual journey and intellectual development. Every scene, except for the last one, takes place in an attic, the open wooden framework of which not only serves as a background but is also a meaningful element of the pictures. In the history of conceptual photography, the attraction to representing building constructions and architectonic structural elements recurs several times. But while here the emphasis is on the study of the abstract forms of the building structure (e.g. 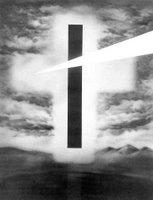 Zsigmond Károlyi’s photo-paintings from 1968), Gémes makes explicit references to Christ and redemption by accentuating the cross shapes of the wooden framework. Boethius’ thoughts – in which the a priori present Highest Good, the divine wisdom is the possessor of everything – were considered in the Middle Ages as the confessions of an early Christian thinker. It is therefore not arbitrary to approach Gémes’ work from this direction. Boethius is present in the tradition as the conveyor of the universal mentality and as such he ”represented either the right of Christianity, or philosophy in general, or a purer mankind” (Tibor Szepessy). The first picture of the series summarises in a pictorial metaphor the metaphysical situation in which intellectual vigilance is activated. This is emphasised by the words Consolatio Mystica written in the intersection of the isosceles triangles symbolising the earthly and heavenly spheres. In the narrow path of ”time out of joint” the frontier separating the earthly and heavenly powers suddenly disappears and it becomes clear that from this point we are following the journey of a soul wandering outside the realm of historical time, on a mere intellectual plane, searching for purification. The attic – as a transitional, connecting place – represents this metaphysical space. The characters of the tableaux, such as the serpent, the angel figure all carry symbolic meanings, they are symbols of the soul yearning for sin and divine wisdom. The shadows (an explicit reference to Plato’s Cave simile) and the light, the sharply separated divided fields and spaces are all part of this sacral theatre, representing the opposite poles. The main character in the montage of the last sheet is a soul armed with wisdom and perspicacity. In the luminous, winged figure the iconographic topos of the resurrected Christ holding a flag can be recognised. This figure with outstretched arms appears first in the Prometheus series, and occupies a central place in Gémes’ oeuvre: after several metamorphoses, it acquires its final form in the Peregrinator figure of the Photographic Etudes. 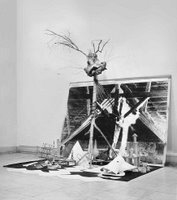 Péter Gémes’ installation was exhibited in the Studio Gallery in 1984 under the title Years of Apprenticeship. The exhibition featured a series of more than 70 photographs, diverse objects and constructions organised into a complicated installation. The reconstruction is made more difficult by the fact that there are no photographs documenting the exhibition, which would help in describing the arrangement of the space and only half of the exhibited photographs exist still. We have to rely on the little information we have in trying to conceptualise the work. There are two sources that could serve as a starting point for the reconstruction. One is a radio interview, the other is András Bán’s writing in which he gives a brief but informative description of the exhibition. The arrangement of the space largely defines and articulates the intention and the series of photographs can only be interpreted within the context of the whole system. According to the concept, all groups of objects had an equal significance. The installation consisted of three main parts, occupying the whole space of the exhibition room: the photographs placed on scaffolds, the silhouette of a building on the wall, and objects scattered on the floor. In the middle of the room, placed on a platform stood a folding wooden construction, shaped after the medieval writing desks, which Gémes made following strict mathematical rules. On top of this desk the artist placed a portfolio with pieces from the series of photographs mounted on cardboard. The scaffold was facing the corner of the room where the silhouette of a Greek church constructed of angle bars appeared between white canvases on the wall. Behind the pulpit, there was a photograph on the wall representing the attic where the series of photographs were taken and the objects appearing in the photographs scattered on the floor. The title of the exhibition is a reference to Goethe’s Wilheim Meister. Goethe’s novel in which he depicts the story of a young soul becoming – through art – a mature and humane man is one of the great narratives of initiation to manhood in European culture. With this gesture Gémes does not only declare his kinship with the intellectual traditions of German Romanticism, but by interpreting his work as a document of his own years of apprenticeship he makes it one of the stages of his large-scale concept. The exhibition was the result of a need for summarising the journey the artist had covered so far and because it was Péter Gémes’ first important exhibition in Hungary, it can be regarded as a kind of debut. The photographs exhibited in the portfolio are the results of a gradual, complex creative procedure. The composition is first conceived on the intellectual level, elaborated to the smallest details. The model for the groups of figures is the artist himself again, Gémes dresses up, puts on the masks of the characters and photographs himself. Then by mounting the pictures one on another he creates groups of figures where the same people feature. The negatives could be further varied, and this way the figures denoted by ritual gestures become symbolic visual toposes, that play different roles in Gémes’ universe, arranged into different scenes. These pictures, produced in several stages give the impression of documenting a performance. Here again Gémes is the person figuring, and by this he is not creating a personal mythology, but a narrative surpassing it. The masked figures appearing in front of a black, neutral background could well be the characters of a sacral theatrical performance. The theatricality of the scenes, the precisely composed movements give a tableau vivant-like effect, which again connects the piece to theatre inasmuch as early theatre can be identified with tableaux vivants. He describes the Years of Apprenticeship as a Hermes-story through which he wishes to study ”serious human behavioural situations”. At this time the artists works were inspired by antic mythology. The easiness with which he treats the subject and guides – sometimes misleads – his observers witnesses his attachment to Károly Kerényi’s intellectual heritage. The exhibited photographs could only be seen by turning the pages of the portfolio. This manner of examination creates temporality and imposes a linear reading on the work. The observer is not a passive subject but an active participant, in some sense Gémes imagines the visitors to be readers of the exhibition. We do not know the order of the pictures; by examining the remaining photographs it is not only impossible to set up a closed system, a classical narrative form with a beginning and an end, but unnecessary too, because the cohesive force between them is of a different nature. Gémes’ pictures can be the best approached through the metaphor of the window standing between the visible and the invisible. This way the photographs can be regarded as independent pictorial aphorisms that lose nothing of their strength if taken out of the series. The scene is again the space of the attic symbolising the no-man’s-land between earth and heaven. This dimension outside historical time and space is the scene of hierophantic manifestations and mythology. The characters figuring in this strange space appear with their attributes, with objects articulating a meaning to be identifiable. The scythe for example is a sign always accompanying a figure with an eared mask, who we may associate not only with death, but with sin, temptation and the personification of the absolute evil. In this mystical, dualistic world – where the basic questions of human existence are treated within the battle of the good and the evil – expression is reduced to the minimum of instruments and gestures. On the level of gestures he evokes iconographic schemes, for example in the scene of the assembly of the gods, where the figures having geometric shapes in place of their heads, put their arms around each other in the manner of the iconographic topos of the three graces. Another instance is the temptation scene, where the gesture of Eve offering the apple appears. The information though is not contained in the recognition of a certain piece, but within the piece itself and through the piece we receive a substantial concentration of the meaning, which has an effect in this context as well. The swift-footed ambassador of the gods can be recognised by his magical instrument, the Hermes-wand, but he does not wear all the attributes known from mythology. Here his role is to represent divine light. Hermes’ darker side – the misleader of the souls in the night and the falsely swearing god of thieves – does not feature at all. In Gémes’ universe Christian symbols mix with the figures of pagan mythology. One of the repeated elements of the scenes is the cross, constructed of squares, like the solution to a puzzle, and the evocation of the saviour’s figure. The photograph representing the attic placed on the wall and the whole arrangement of space is the instrument of giving the exhibition space a sacral character. Gémes considers art a sacred principle, therefore the act of taking in art becomes a ritual ceremony which requires a consecrated space. Mircea Eliade writes the following about the separation of sacral and profane space: ”Every consecrated space has some kind of a hierophany connected to it, through which sacredness emerges, and by moving a defined space out of its cosmic surrounding it changes it qualitatively.” Gémes’ arrangement aims at defining such a space transformed in quality. The visitor can immediately identify the objects appearing in the photographs of the portfolio with the ones scattered on the floor (and the attic represented in the photograph on the wall with the setting of the scenes) and thus enters the metaphysical space in which they come to life. The objects in the photographs do not only function as attributes (scythe, sword, wand...), but they actively participate in the action as well. The cubes sometimes form little churches, and even the chariot of the souls appears in the form of a small toy. These – as already mentioned – can be seen in their physical reality, scattered on the floor behind the writing desk. We know from András Bán’s article that the objects in the photographs that seem to be terrible weapons are in fact cut out from paper and only the toys are real. Playing this way with the pictorial representation carries the same intention as the emphasis on showing the perforations of the rolls of film: it reminds us of the contradiction between the photograph (as an instrument of exactness) and the world of meaning it represents, and warns us of the paradox character of their relationship. The quotation cited above is taken from Hamvas’ essay entitled Arlequin. This quotation featured in the catalogue of Gémes’ exhibition Years of Peregrination, organised in 1986 at the Dorottya street exhibition showroom. The works exhibited at the show following the Years of Apprenticeship are the ones that define with all force the direction the whole of his oeuvre. Here he no longer has his mythological figures appear in serial pieces, complex structured series of pictures. He attempts to bring the invisible closer to visibility through monumental compositions representing several figures at the same time. The above quotation is interesting because it demonstrates to us why Gémes’ artistic identification with the ideas put forth in Arlequin is adequate in connection to Years of Peregrination. In Hamvas’ work Arlequin is one of the main figures of human existence, he is the cosmic baby and he is closely related to the turning point, the situation out of joint in which things appear in a fundamentally new light. This figure who contemplates the peripheries of existence is the intellectual bearer of intact purities, he exists in the state of the world out of joint. Gémes, after the revelational turning point of the crystallisation of the intention identifies with Arlequin and sees with his eyes. This gesture concentrates creative forces that turn him in a new direction. His need for larger than life-size compositions first manifested itself in the works of the Years of Peregrination exhibition. He wished to bring to life the compositions already existing on photographs in an enormous size, but his technical equipment did not allow such a large-scale enlargement. He painted the scenes on paper and large pieces of sheeting with Indian ink, which then gave a black and white photographic effect. The paintings were based on photo-graphics made by the layered process. Because of the difficulties mentioned above, the artist had to return to painting, but he tried to preserve the effect of photography. He did not apply the traditional painting techniques, instead of using canvas he painted on enormous pieces of creased sheeting with Indian ink and to refine he used the airbrush technique. The painting entitled Years of Peregrination figures several characters of which the main one is the figure of a woman in battle equipment that we know from the offset print Goddess. With her striking sword she divides the figures around her into two groups that can be identified as the representatives of the earthly and heavenly spheres. Standing next to the main figure of the hieratic composition, we discover the warlike goddess, Pallas Athene with her sword and shield with snakes. The rest of the characters of the ritual ceremony are warriors in Greek helmets and opposite them – and opposing them on the intellectual plane as well – the veiled, introverted figure of the Philosopher. The source of Gémes’ art is in ”the contemplation of the ruins of the past” (Krisztina Dékei), but we also find concrete art historical references and quotations. He builds the gestures and compositional schemes into his works as motives. He relies on images that have already acquired a form in art with a condensed meaning, that contain archetypal notions and that have become toposes. Another important painting of the exhibition, the Ruins of Toledo can be regarded as the matching pair of the Years of Peregrination for its sacral composition and theme. (The painting was unfortunately lost at the Biennial of São Paulo in 1987.) In the hierophanic scene the divine messenger appears and warriors, falling on their knees before a winged angel figure. The main character of this composition is the Peregrinator of the Cave Allegory, whose accented role in the whole of the oeuvre shows similarities with Kondor’s art. The resemblance between the two oeuvres can be summarised as a need for creating myths and universality: ”His art is thus meditation over the social-historical fate of mankind, over the history of human foolishness” writes Lajos Németh of Kondor. Gémes though, tells the story of mankind in the metaphorical language of mythology, through the philosophical and art historical tradition. El Greco’s painting entitled Toledo Landscape is evoked in the background, adding apocalyptic connections to the meaning. Created in a style similar to the above mentioned works – blurred, vision-like representation – pictures of body parts enlarged to an enormous size also appeared at the exhibition. The monumental representations constitute an almost indiscernible mass, their function was rather to install the figurative compositions, to transform the exhibition space. The depicting of body parts, the imprint of the artist’s body as the only dominating theme – and medium – will reappear in Gémes’ art in the 90s, in a completely new light. It is characteristic of the catalogue of the Years of Peregrination – and in fact of nearly every one of Gémes’ catalogues – that we do not find reproductions in them, but pictures made up of the figures appearing in the exhibited works, variations of the compositions and of the negatives used as a basis for the paintings. These were made exclusively for the catalogue and have no reality otherwise. In this sense they are not documents, but the catalogues themselves become works of art. (It is not by coincidence that the texts of the catalogue are not interpretational, but rather meditative chains of thoughts.) In the catalogue of the exhibition Years of Apprenticeship, we find the variants of the photographs exhibited, transformed into graphics and completed with new pictorial elements. From this creative period, the most important work regarding the whole of the oeuvre is the Cave Allegory I–III. series. The technique used by the artist is similar to that of the Years of Peregrination and the Ruins of Toledo: the pictures were painted with Indian ink, after photographs. In comparison to the earlier works though, their pictorial world results from significant reductions. The negative dim of the photographs representing single figures anticipates the Photographic Etudes. The muddiness, the dream-like character is the result of painting after photographs drawn with the light of a torch in a darkened atelier. The titles unambiguously define the direction of the interpretation, the Guard and the Philosopher have stepped out of Plato’s Republic. Plato uses the cave simile to illustrate his theory of existence and acquisition. He describes the people lacking the wisdom of philosophy as living in a cave and thinking the shadows cast on the wall by the fire to be the real world, deprived of clear vision they take the world of shadows for the real one. The world of shadows is no other than the changing and transitory world of sensation. It is only the philosophers who ”can grasp the eternally existing” and separate it from the changeable world of senses, therefore in Plato’s ideal republic they are the ones destined to govern the state and shape it after the divine example. In Gémes’ work the Philosopher is represented in the style of Hellenistic philosopher portraits: he stands in a dignified pose, gazing into distance, holding the mantle wrapped around his body. The Guard appears fully armed, raising a fiery sword which – as a symbol of divine rule – becomes a sort of attribute of the Guard’s profession, as the devoted protector of the philosopher’s republic based on wisdom. The third piece of the Cave Allegory series is the Peregrinator, which reveals to us the artist’s credo. In this vision-like figure appearing in front of a glaring white background it is not one of the members of the republic – understanding (philosopher), courage (guards), moderation (labourers) – that we recognise. Gémes, through the figure of the messenger seems to bring back the artist from the Platonic exile. The title, Photographic Etudes, covers a 26-piece series produced between 1981 and 1991, out of which only 23 exist today. The Studies were made by the photographic method – similar to the layered method of lithography – creating a special pictorial world typical of Gémes only. 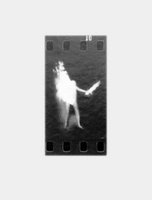 The works are built on the range of negatives exposed during this ten-year period, from which the artist chooses and transfers the figures left in negative into the works, placing his figures into narrative situations. During the artist’s lifetime the Etudes were not displayed in one – which is against their interpretation as a par excellence series – therefore, reality is not gained through the recognition of coherence among the sequences, but rather exist as individual works. In the negative dim the artist creates a tableau, implying the sacral dignity of the group of people dressed in archaic-styled costumes in a ritual scene of archaic culture. Resulting from the superimposition of the negatives – used as transparent surfaces – a dream-like effect independent of time and place is brought about in his works. Again, the model is the artist himself and the infant figures are his own children. Still, the meaning is not articulated through the possibility of their identification. In the Photographic Etudes, once more, Gémes attempted to dramatise the superindividual, sublimated human fate. It does not really matter whether we identify him or not, the hiding artistic attitude is the manifestation of the acceptance of the role of the medium. Placing his ego into mythic situations the artist himself functions simply as a transparent subject, through whom the spiritual reality – represented by himself – reveals itself. The evocation of magical implications and the emphatically symbolic pictorial thinking in his works are not aimed to build up a private mythological universe. Ildikó D. Udvary, while observing the dominant symbolic purport in fine art in the 1980s and their possible interpretations, points out the presence of two basic and opposing artistic attitudes: ”The empty space caused by the gradual loss of the meaning of cultural symbols triggers an active response on the one hand, and a passive, introvert attitude on the other (private mythologies).” Péter Gémes’ artistic activity is based on an active, myth-making intention that points beyond himself. Nevertheless, regarding the elements of his pictures we cannot talk about the construction of pseudo-symbols either, for his art obviously reflects a return to traditional roots, which he achieves by using the pictorial toposes – abundant in symbolic meaning – of the Egyptian, Antique and Early-Christian art. It is not only by his systematic use of autochton signs that he gets into a well-definable narrative of the history of ideas, but also by representing gestures and iconographically compressed meanings into a frame-theme. The characters of the photo-graphics – the warrior, the king and the magician – are the visual and sensual conveyors of the intellectual-spiritual meaning they stand for. The titles allow for a depth-psychological approach as long as we identify them as the archetypes of mythologemas. The psychological interpretation of iconography started with applying Jung’s definition of ”archetype” in the philosophy of art. However, Jung used the term in rather varied ways, sometimes he identified it with the symbol (when talking about archetypal pictures), at other times he applied it to describe the complexity of the many-fold psychic processes, that is to the whole myth-making structure working in the human unconscious. Therefore it is not evident whether we can employ the term in the history of art, as distinguisuished from the archetypal pictures, which he labelled the pictures containing simple intellectual symbolism with an ”especially strong human meaning” (Jan Bialostocki). In his compositions Gémes falls back on the power of compressed meaning of the mythological pictures, based on the specific visualising ability of the human psyche, through which he does not tell stories of individuals but of communities. Fixed in their pose the main characters of the Studies reappear in different compositions. The enthroned king beckoning with his sceptre, represented in accordance with the manner of depiction of the rulers in the Carolingian age, is the embodiment of wisdom and sublime intellectual dignity. The figure of the falling hero wears the schematic armour of Greek warriors and recalls the image of relieves ornamenting the tympanums of ancient churches. The central figure of Wisdom appears to have just stepped out from Consolatio, like the allegorical female figure of Philosophy materialising for Boethius. From an iconographic aspect she represents the manner of portrayal of the medieval female saints holding her attribute in her hand and, also, in front of her the little village devoted to her – built from tiny blocks – seems to appear. The objects and weapons appearing in the pictorial scheme taken from scenes of triumph and battle play equally important role as the gestures. However, the shields and crowns are not represented in period style, thus they do not serve as props defining the historical age they come from. Furthermore, if we observe them closely, it turns out that the fierce weapons are merely cut out of paper and toys just as we saw in the Years of Apprenticeship. József Bárdosi in his work dealing with Péter Gémes’ art, points out that the ”invisible harmony” – created by the fusion of traditions of diverse cultures and evoked images of the toposes – can obviously be found in Gémes’ synoptic way of thinking and seeing, in which the influence of Heraclitus has a significant role. He takes quotations from Heraclitus for some of the titles of Photographic Etudes, as for instance in the case of The Bow is Called Life and its Work is Death (Heraclitus Study IV), in which picture we see male figures in hoods shooting with bows. Gémes started reading Heraclitus inspired by the writings of Béla Hamvas. The mysterious Greek philosopher has an especially important role in Hamvas’ metaphysical view on history. He places the axis separating the Golden Age and the Apocaliptic Age on the continuum of historical time around BC 600, thus for Hamvas the philosopher living at that time is the eye-witness of ”reality split into two” and ”the existence degraded to life”, and he is also the recorder and the last man of Golden Age. For Hamvas the reason why Heraclitus’ sequences were impossible to be solved by the later thinkers and that his texts were considered vague and inextricable, originates also from this split. The language of the Heraclitean philosophy is still the pure pictorial language of archaic culture – which is expressed by drawing the words on the archetypes – which by the appearance of the Sophists lost its ”inner-light, radiance, pictorial quality”. Heraclitus verbalised his views on nature that is based on opposites and everlasting changes, his theory on the divine Logos in the form of mythic speeches. It is not only by his choices of titles – showing the direction of interpretation – that Gémes is connected to Heraclitus but he also transforms the metaphorical pictures of philosophical maxims into symbols on the grounds of visuality. In this sense the philosophical references of his pictures are sometimes more significant than their visual connotations. The depiction of the bow (”...a backward-turning adjustment like that of the bow or the lyre. The bow is called life and its work is death.”), the circle (”Because beginning and end are common on the perimeter of the circle.”), the playing children (”Time is a child playing draughts...”) or the sleepers (”Those awake have one common world, and the sleepers all step into different worlds”), and the origin of their symbolic content is to be found in Heraclitus’ linguistic metaphors. The didactic correlation between the philosophical texts and the pictorial elements appearing in Gémes’s works does not exclude other possible interpretations of the works. ”Péter Gémes creates such intermediary works which are situated on the other side of empirical reality impossible to experience, in the way suggesting transcendency. The objects placed into the light of another world are meditative objects”, writes Eszter Babarczy about Gémes’ negative pictures. This is the point where the art of Péter Gémes touches upon the Heraclitean philosophy in its essence. For Heraclitus, beyond the despised earthly existence based on the circulation of satisfaction, there is only the common logos unifying the individuals, the ultimate reality, the sole important ontological reality, into which, however, the individual can only look into through the initiation based on the most profound cognition. Gémes’s transparent and static pictorial universe is the lyrical pictorial confession of his attempt to look through. Some of the pictures of Photographic Etudes were even processed into huge size photo-canvases (Farewell, Ferryman II, Heraclitus Study.) According to some of the interpretations, Gémes’s small size photographs have in fact no real existence they only work when being enlarged to a bigger size. However, we have to argue with this view. We have mentioned earlier, in connection with Gémes’ use of photography, the essential distinction between its uses in photography and in visual art. The reason for regarding his smaller pictures as works of art is not simply because he builds on the original documenting function of photography, but also for the fact that the artist exhibited these smaller pictures applied on photopaper as well. The pictures, therefore, do not gain their ultimate reality through enlargement, even if the pictorial meaning is veritably intensified in them. Although the picture entitled Predellum is not included in the series of the Etudes, still, considering its content and build-up it can be regarded as the summary of the period marked by the Etudes. Gémes’ synoptic aim is revealed by the use of emphasised pictorial elements of the composition and symbols. Predellum stands at the intersection of his artistic career, since the problems of form arising in it already represent a turn towards a new direction. The huge work, compiling three photo-canvases of enlarged negatives, form the predelle of Gothic altars. The horizontal male figure shown from side view seems as if laid on a bier with his hands crossed on his chest and his legs and chest ivy-covered. The evergreen plant, the dominant motif of circles, the sign of infinitude all denote the eternity of the soul and the thought of redemption. The reappearing motif of Years of Apprenticeship, the cross, made of pieces of slate reappears, as a Christian analogy of the earlier thoughts. The drawing of the modelled Greek galley in the central piece refers to Charon’s boat, which carried the souls across the river of hell, the Styx. 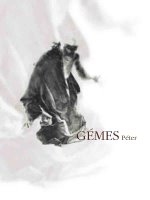 We cannot disregard the biographical allusion of the picture, the serious disease from which Péter Gémes suffered from the late 1980s, and with which he had to live since his first brain operation. Besides the Peregrinator, the Predellum can be regarded as a certain kind of self-portrait of the artist, in which he reflects not only on his personal fate, but through it, he treats the mystery of relief in death represented by an extremely powerful pictorial metaphor. 1. I wish to thank Klára Héjj, widow of the artist for the help in my research, and for all her support, and Krisztina Dékei art historian who left the documentation made for the Soros Foundation Contemporary Art Centre in 1994 at my disposal and also for her useful critical remarks. 2. The cover for Erzsébet Szõnyi’s , the artist’s mother’s record was designed by Gémes, using a fragment of one of his earlier paintings. The whereabouts of the painting is unfortunately unknown. 9. The reconstruction of the whole of the series raises a few questions as well. The only reference point is the catalogue of the Studio exhibition organised at the Ernst Museum in 1983, where we find a reproduction of one of the pieces. According to the catalogue, the series consisted of four pieces, while in the estate there are eight pieces, which can be regarded as equal parts of the series, in style and content as well. Because on the original of the piece reproduced in the catalogue there is no signature, and on the rest of the sheets we find no signs either that would suggest that the artist only regarded the exhibited four collages as members of the series, I take all eight pieces as a basis.